Most music today is afflicted with a depressing sameness. Even when it's good it feels like something we heard yesterday or last week or years ago. Rosler's Recording Booth isn't really like anything you've heard before, and that's it's major strength. There are real stories here, and each song evokes something different. There is nostalgia here, and pain, and hope and acceptance and resilience. Track to track the CD shifts colors, and this is helped by a powerhouse cast of guest vocalists. John Margolis and Kathena Bryant are particular standouts here. Rosler's Recording Booth has a brain, and a heart, and a soul. How many CDs can we say that about anymore? "ROSLER’S RECORDING BOOTH” is an amazing blend of old and new! It’s not only creative and imaginative, but wonderfully entertaining! 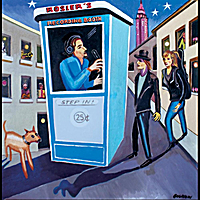 An eclectic mix of all types of music and unique artists, along with the genius of Rosler’s compositions, along with the nostalgic recording booth soundbites make it a wonderful CD for anyone to own. I never knew what was coming next. Moving and fun like a carnival. Spottiswoode is one of my all-time favorites. Kathena Bryant was a revelation. Jeremy Sisto can do no wrong in my book though had no idea he sang. I wasn't familiar with some of the guest stars but they were all great.